Happy New Year! The New Year is a time when we look back on all that we have achieved in the past year and then focus ahead to what we want to accomplish in the coming year. 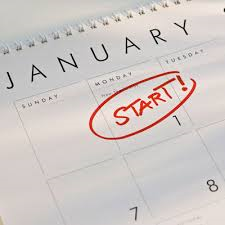 Many people take this time to set resolutions or goals for themselves for the year to come. It is always a good idea to set goals for ourselves and to reflect on whether the goals we have set in the past are still realistic for us. Sometimes, we can be a bit too hard on ourselves and set goals or make resolutions that are unachievable, thereby setting ourselves up for failure. Often the resolutions we make on January 1st are abandoned by month’s end as we find we can not seem to keep ourselves on track to achieve them. This year, why not take some time to sit down and consider some simple ways to set goals for the coming year that you will not only be able to achieve but also exceed? For many of us, health and fitness are at the top of our list of things to tackle in the New Year. After the indulgences of the holidays, it is often something that we see as a big priority. Maybe it is something that we have been putting off for months, using the New Year as an excuse to delay getting started. Well, the time has now come to get going! Here are a few tips to help you set goals that are realistic, achievable and can be accomplished in a timely manner. 1. Small Steps – If you have been leading a relatively inactive lifestyle, you will want to start with small steps, gradually increasing the activity that you incorporate in to your daily life. Begin with trying to add just a few more minutes of physical activity every day by making changes like taking the stairs instead of the elevator or parking further away. Add in activities that you enjoy gradually. The more you enjoy the activity, the more likely you are to keep it up in the months to come. A great way to monitor your increasing activity level is by investing in a pedometer. Log your daily step count and aim to work your way up to 10,000 steps per day. 2. Find FUN – For most of us, exercise feels like work! It is often something that we dread and have to really force ourselves to do. If this is the case for you, it is time to find something that you consider FUN to make part of your exercise routine. Whether it is joining a group fitness program, taking up a sport, or making a date with a workout buddy, find something that takes the work out of exercise and makes it enjoyable for you. If you are having a good time, you are much more likely to keep it up! 3. Keep a Journal – Keeping a food and exercise journal can be a great tool to help you determine your patterns and keep yourself accountable. Often we undertake an intense fitness program or a strict diet and can’t understand why we aren’t seeing results. It is important to recognize that diet and exercise go hand in hand and one should accompany the other. Healthy eating and regular fitness activity is the key to success. By keeping a log of both your diet and exercise, you will be able to identify patterns that may be standing in the way to your success. 4. Be Kind to Yourself – Remember that no matter how hard we try, sometimes we will have a bad day and will get off track. The key is to not let a small slip allow you to become completely derailed. Recognize that you have had an off day and then get yourself back on track. Don’t allow a small slip up to completely derail you and give up completely. Keep in mind that a small setback is not going to be the end of the world. Be kind to yourself and give it another try! Hopefully these tips will help you on your way to achieving your goals! Take one day at a time and be sure you are enjoying what you do and you are sure to see success!